New features, like the ability to bulk delete or void transactions, and better manage client vendor-related expenses, will save you and your clients valuable time. Comes with a 60-day money back guarantee. Contact us for the best pricing and to complete purchase of QuickBooks Accountant. A change in sales tax requirements for the sale of online products means you will not be able to complete a purchase without contacting us. We are working to resolve this situation. Please call 303-801-4772 or use this link so we can complete your purchase for you. This is Intuit’s best ever desktop accounting system designed exclusively for accountants. Client Collaborator saves you time by tracking client conversations inside QuickBooks. Accountant Toolbox improves productivity by giving you access to accountant features from your client’s QuickBooks. In two clicks, see which filters have been applied to a report. Use visible filters to easily reproduce memorized reports. 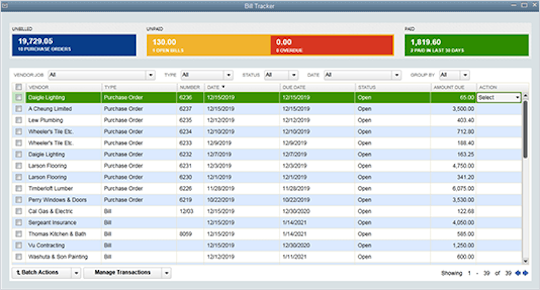 Track all vendor-related bills in a single window. See which bills are overdue at a glance. Take immediate action on any and all open items.